The James Wylie House, White Sulphur Springs, West Virginia. At The Base Of The Allegheny Mountains. 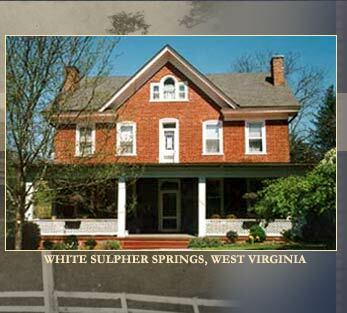 The quaint village of White Sulphur Springs serves as home to the historic James Wylie House Bed and Breakfast. For nearly 200 years, this beautiful home has hosted the many travelers visiting the Spa City, golfing the many renowned courses, and hiking in the surrounding State and National Forests. Built in 1819 by master builder John Dunn, the house began life as a farmhouse commanding over 1,300 acres of land. Fully restored, the house and cabin were place on the National Register of Historic Homes in 1990. The Greenbrier Valley, rich in Civil War history and outdoor adventures, offers guests a wide array of activities from ghost tours to mountain biking, from historic golf courses to caving. Come experience all we can show you: spend a day picnicking, browsing the many local shops and art galleries, fish one of the nearby lakes or streams, or take a wild ride white water rafting. We have something for everyone! Sumptuous breakfast served at the convenience of our guests. Amtrak rail to White Sulphur Springs from DC and Cincinnati, Ohio. Less than a mile from the Greenbrier Resort. Website design and hosting by Blizzard Internet Marketing, Inc.